PT Astra International Tbk - Astra International known as "Astra Group" a leading and reputable diversified business conglomerates in Indonesia. Together with its 200 subsidiary companies, joint ventures and associates, and served by more than 200,000 employees, Astra Group has defined the following 7 (seven) business pillars; automotive, financial services, heavy equipment and mining, agribusiness, infrastructure and logistics, information technology, and property. Astra Group was first established in 1957 and initially started as a small trading company named PT Astra International Inc. Later in 1990, the Company conducted its Initial Public Offering (IPO) and the name of the Company changed to PT Astra International Tbk. Astra Group was listed on the Indonesia Stock Exchange (IDX) under reference code ASII. At present, Astra Group is majority owned by Jardine Cycle & Carriage of Singapore (JC&C) which in turn is majority owned by the Jardine Matheson Group. As of December 2016, Jardine Cycle & Carriage of Singapore has a 50.11% interest in Astra Group. Other remaining interest in Astra Group was owned by general public and investors. According to information found in PT Astra International Tbk 2017 first half financial statements as cited by JobsCDC.com, Astra Group has recorded a significant growth and satisfactory performance in the first half of 2017 (1H 2017, ended in 30 June 2017). Astra Group booked total revenue of Rp98,031 billion in 1H 2017. That number is an 11% increase from Rp88,208 billion in 1H 2016. Total net income increased by 31% from the previous year, from Rp7,116 billion in 1H 2016 to Rp9,357 billion in 1H 2017. HC TRAINEE is the 12 months extensive development program that will give you opportunities to be a great HC Professional. During the program you will be exposed to different HC roles in different type of business with both of in class training and on the job training . Bachelor Degree (S1), majoring in All Economics, Psychology, Law, Industrial Engineering, Communication and Business Administration. Both fresh graduate or experienced (maximum 2 years) candidates are welcome to apply. Strong analytical thinking and interpersonal skills. AUDIT TRAINEE is the 12 months extensive development program in auditing field which certified by audit competencies that in line with the objective of Internal Audit Astra Group (operational audit, financial audit and IT audit). You will be develop to become a credible Auditor through variety program in class training and on the job training (basic Astra values and business process, basic finance, accounting and tax basic auditing, general IT Auditor and various soft skill training). JobsCDC.com now available on android device. Download now on Google Play here. Please be aware of recruitment fraud. The entire stage of this selection process is free of charge. 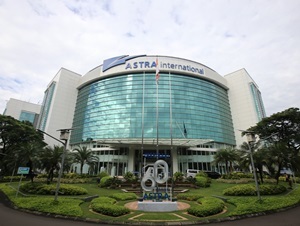 PT Astra International Tbk - HC Trainee, AR Trainee Astra Group December 2018 will never ask for fees or upfront payments for any purposes during the recruitment process such as transportation and accommodation.